An expo does not happen without donors, and we need games in order for an event like this to be successful! Collectors and enthusiasts like yourself help make YEGPIN what it is. Without you, this show couldn’t exist. For your contribution you will receive a FREE all access VIP weekend admission to YEGPIN by bringing at least one Pinball Machine or Arcade Game! The machine must be in good working condition, set to FREE PLAY, and be ready when the show opens. Additionally, special signage will be made up for each machine to show the donors information so you are recognized for your contribution. Transportation can be negotiated for donors looking to bring multiple machines to the event. Our transport service is top notch and we ensure your machine is well taken care of for the weekend, in all cases the machine either comes back in the same condition or even better once the show is over. All donor machines brought to YEGPIN will be entered into our various Best in Show competitions, giving you a chance to win various prizes including more entries to win a pinball or arcade machine (tickets are for the same type of machine brought). So bring that prized possession from your game room and let others enjoy it for this yearly event! Who knows? You might just take home a Best of Show award, or better yet win a new machine for your collection!!!! The first step is filling out the form below. If your games are accepted, you will be contacted at a later date and be asked to sign a document confirming the details of delivery. You will also be asked to sign a release form, excusing YEGPIN and event staff from any liability with regard to the use and transportation of your game(s). Bring a game, win a game reward program (Yes, you read that correctly, for bringing a machine to YEGPIN you get a chance to win a pinball and/or an arcade machine for your collection). For every pinball machine or arcade machine that you contribute to the YEGPIN you will get a chance to win a restored pinball machine (valued over $3000) or a restored Arcade Machine (valued over $1000). Additionally there will be three extra draws specifically for donors (worth approx $250 each). In total, YEGPIN is providing over $5000 in draws to donors who contribute to our show. * In some cases single game pickups may be considered. Machines (Pinball and/or Arcade) MUST be there the entire day or weekend to maintain your lanyard validity. All machines will be tagged with a number. If the machine you brought is removed from the game room before the day is over, YOU will be asked to pay the day(s) pass charge for your lanyard. If you bring a machine, YOU are responsible for making sure the machine stays up and running or providing permission to our on-site technicians to troubleshoot and fix the issue. 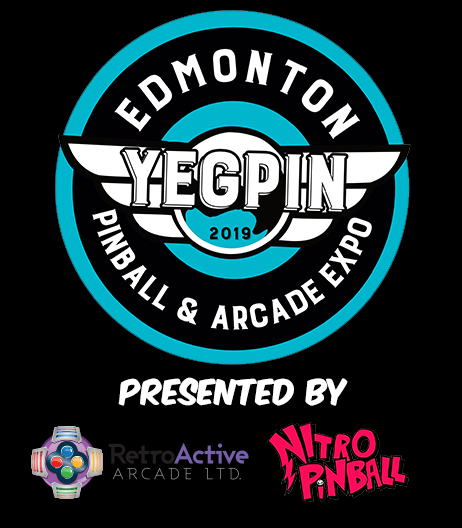 Neither the YEPGPIN: 2019 Edmonton Pinball and Arcade Expo nor the Millennium Place takes responsibility for any damages done to your pinball or arcade machine. A waiver must be signed by the owner upon delivery of machine to facility or pickup of the machine from their residence. If you would like to bring a pinball machine or classic arcade game to YEGPIN please fill the form out below. Please continue to read below. What types of games is YEGPIN seeking? 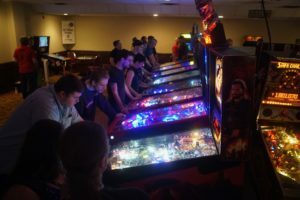 We are seeking full-sized video game machines, dance machines, pinball machines, and anything interactive for our attendees that is unique or entertaining. Console collections will not be considered as we have limited floor space. How should I prepare my game for the event? All games, whether pinball, video game, or otherwise should be set to free-play. If setting any game to free-play is not possible, the replay value should be set as low as possible, and YEGPIN staff should be notified during the drop-off procedure so they can ensure it is properly credited for the duration of the event. The keys need to be left with YEGPIN and will be returned when pickup is scheduled. All games should be in working order prior to arrival at the event. If any game is unusable upon arrival, it will not be placed on the show floor or count toward a reward. Please ensure any loose items or toppers are secured to the game or removed prior to beginning the event so that they don’t fall off or become misplaced. How should I prepare my game if it is placed in the pinball tournament? YEGPIN prides itself on having the very best games available for our tournaments. The Tournament Director will be in touch with the collector for setup instructions. Note: machines are normally modified in software settings and should have all new rubbers, strong flippers, lively bumpers hair trigger sling action and put on advanced post settings where possible. The machines need to be mechanically sound and reliable and every switch must be tested to ensure they do not affect scoring. All machines should be cleaned and waxed upon their arrival to save technician time in setting them up for the tournament. Note: If your machine is used in any of our tournaments you will receive a bonus entry into the draw for that donation. How can I get my game(s) to YEGPIN? A drop off schedule will be coordinated with a member of the YEGPIN volunteer team during the last week of the upcoming event. In cases where you cannot drop off your machine we can negotiate a pickup if there are multiple machines being donated for the event. Any out of town guests who wish to bring game(s) must make their own arrangements to get the machine to the facility for setup. Yes, the facility will be secured 24 hours a day, and our volunteer team will be on the floor monitoring all machine activity. Abuse of any kind will not be tolerated at the event. What if I have to arrive late or leave early? We greatly discourage late arrivals or early departures, but we can sometimes make exceptions depending on what game(s) are in question. In all cases, these exceptions should be cleared ahead of time, preferably during the sign up procedure. If your game qualifies for one of these exceptions, you will likely be placed in an area closest to the appropriate loading area to eliminate any additional traffic on the show floor. What if something breaks on my game? If you have previously agreed to allow our technicians to fix your game, we will attempt to do so. If you have not agreed to allow our technicians to fix your game, we will attempt to contact you. If we are unsuccessful at contacting you, the game may be removed from the show floor and placed into a storage area. In all cases, our technicians will only attempt to fix basic problems. Any game requiring major repair may be removed from the show floor, as well you will not qualify for the bring a game, get a game award.